After receiving some nice comments on “the lover” I decided to take a pic of the lady that was in the same box. I wasn’t too pleased with the face on this one and although I could probably have fixed her, it would have meant a rebuking. Thinking about that now I can probably change her a bit with some air dry clay. Maybe? I don’t know if the air dry clay will stick to the polymer clay. And I know it’s not my call, but I think her face is absolutely delightful. I’m glad you got her out of the box. Thanks, Jonni. Her eyes stick out more than I like, but I think I will leave her be. She will just go back in the box. If I did try I would have to glue bits on so I don’t think I’ll bother. I don’t have any place to put her and no one to give her to. Her spoon looks as if the handle had melted.? Love it Joyce! There is nothing wrong with her face. She looks adorable and happy. Thank you, Corinne. I loved working with polymer clay, but baking at the right temperature is crucial and my oven became too temperamental and a new stove was out of the question. 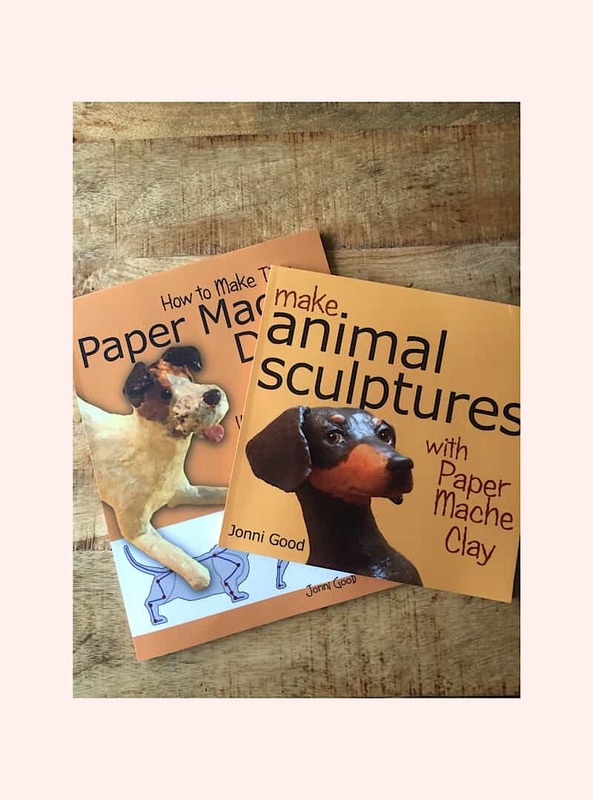 Then I found this site and although I haven’t actually used the paper mache I learned a lot about making armature. This site has given me so much pleasure, especially since various health problems have prevented me from doing anything except some digital art on my iPad and a few poems. I am so glad I found Jonni and UPM! Finally Maggie has her sisters she always wanted ?? Awww – She’s such a proud sister, as she should be. 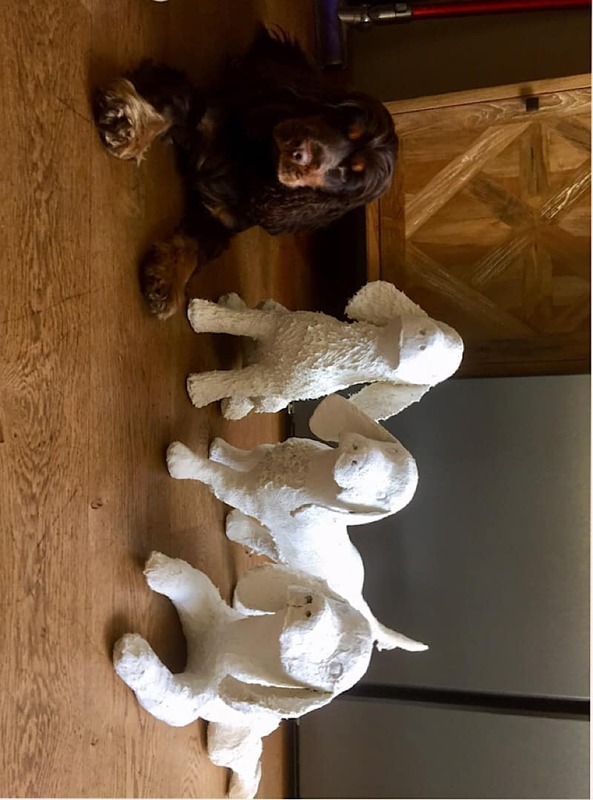 What a wonderful group of sculptures, Corinne. Every one is different, and they’re all just perfect. Thanks so much for showing them to us. Corinne, Now I’m jealous all over again. That is great. And Maggie has her sisters. Awesome. Your dogs has made me think differently about the pack of dogs I want to do, so thank you for that. Please post them painted — if you’re going to paint them. (I like that black one!) I love the work you have done and thanks for the inspiration. Thank you for the compliment Rex. I am very curious in which way you changed your mind about your pack of dogs. Do you have a certain breed in mind? I am going with a different approach as to how I make the fur. Also, I think a rougher finish will probably help. I want to do min pins. I have a small one sitting down that needs painting and at least two more are needed! Thanks. I had to wait three weeks for it but it’s definitely worth the waiting for. Thank you for these inspirational books. I’m glad you like them. But why did it take so long? Did amazon.com have to ship them overseas? In any case, I’m glad they arrived. When you’re finished with some of the projects, come back and show them off. We’d love to see how they come out. Hi Jonni, I live in The Netherlands and ordered the books locally so I knew upfront. Tomorrow I am gonna buy the golden acrylic glazing liquid, never tried it before. Corinne, Jonni’s books (that you just received) changed my life. If you follow the projects, it will make you better in every way. You will love making the penguins. I have made three large sets, but they all manage to migrate somewhere else. People love them. I made a mom, dad, baby, and egg for myself, but an autistic kid came by and was obviously very excited when he saw them. He took them, and they have a very good home, which is only right. I’m excited to see them. I love the glazing liquid, especially when you blend colors like you will be doing on the penguins. Can’t wait. Hi Rex, you are right. The books are so helpful and full of tips. I also like the coloring tips, somehow I often seem to struggle in getting the colors right, but the glazing liquid helps a lot. The best book I have found about colors is “Blue and Yellow don’t make Green,” by Michael Wilcox. If you want a brief tutor, I could tell you what colors I use. Having said that, you ought to see my paint pallet now. I’ve been trying to make browns as Jonni’s daughter showed us, and it has been an experiment! Hi Rex, sorry for my late reply and thank you for kindly offering your brief tutoring. In the meanwhile I found a dutch (oil)painter who suggested to make your own color pallet. I started enthusiastic but didn’t realize that it would take me 3 days to get it finished. And now I have, I am glad. 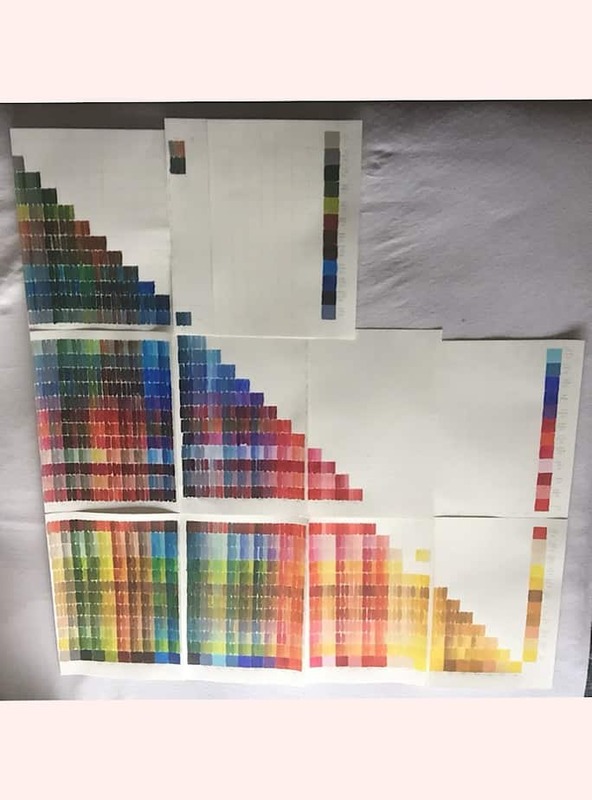 It helps me a lot to get the colors right. Maggie is almost finished. I’ll post a picture soon. How is your pack coming along? Eileen he/she is Beautiful, i just want to give it a hug. 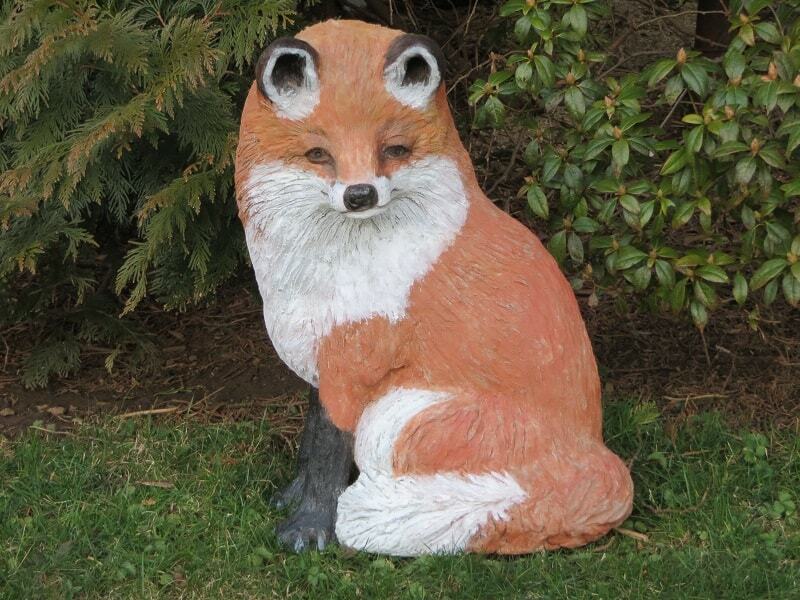 Eileen, thanks for the fox! That will definitely be the best chuckle of the day. That expression is priceless. I think I need to quit doing smooth surfaces on furry animals. The fur looks great on him, and wonderful colors. Ok, this is not paper mache but is Pal Tiya. The basics of the sculpting is the same however, just different working and curing time. I call him sleepy fox. He’s gorgeous! What a nice sculpture for the garden. In case anyone is wondering, you can find the Pal Tiya website here. I have never heard of Pal Tiya before. Great idea for a next project. He’s lovely and he does look sleepy. Probably tired from chasing all the chickens…in a good way. When my daughter needed a giraffe costume for her high school musical production of The Ark, I found you patterns. 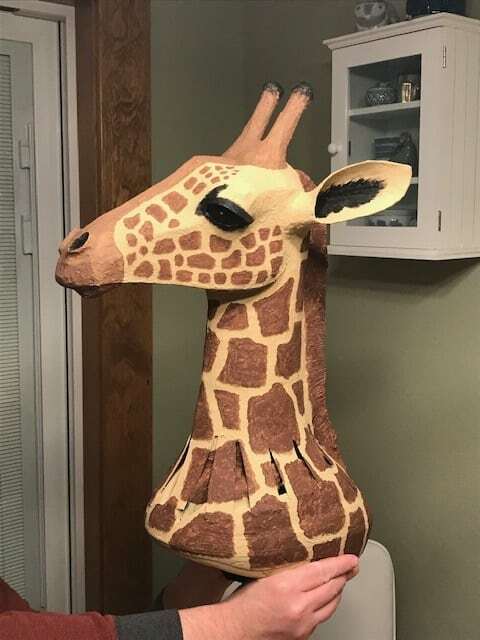 I used the giraffe pattern to make a head that I attached to a bicycle helmet. I skipped a few steps, leaving the paper mache clay as the final layer. I never could have made such a detailed model without your pattern. Many thanks! Sure, feel free to copy my comment. I would definitely give it 5 out of 5 stars. The directions were very clear and with time and care all of the pattern pieces fit together perfectly! People were amazed that I made it. And photo too of course. Jean – your giraffe is wonderful! I bet your giraffe was the best looking critter in the play! I am converting Jonni’s giraffe pattern into a dragon for a Chinese Dragon Dance costume for my community’s annual July 4th parade. (This is our 25th year!) I have figured out a simple eye mechanism but am having problems with the jaw. I’d like it to be closed most of the time with an easy-to-use “something” to open it. I plan to use one hand for the eyes and the other hand for the jaw. The jaw will be close to 14” wide and 19” long. I am not mechanical – I could not replicate solutions on the Internet. Nice Jean! Didn’t your daughter struggle with the balance. She must have been very proud of her mom. Jean, that is genius — almost obvious! Of course, put the mask on a bicycle helmet. Great idea. And I love giraffes and love this one. You have a lucky daughter, and she has a lucky mom. Just touched me. Thank you. 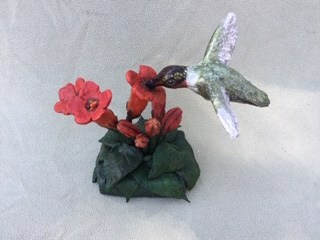 Here is a hummingbird enjoying some trumpet vine flowers. I know people will ask so i will tell you that there is a wire going the entire length of the bird, on through the flower and imbedded into the base. It still had to be supported by the other flowers and buds though. Very nice, Eileen. The detail is amazing, and it’s so delicate. What materials did you use to make it,and how big is it? Thanks Jonni. 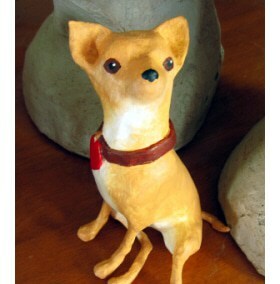 It is about 6 inches tall and is all made with your smooth air dry clay. 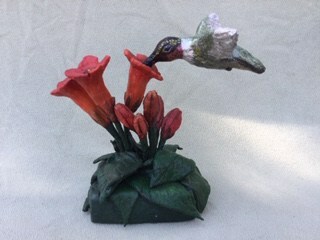 The base is styrofoam covered with the clay and the leaves are pure smooth clay with no armature. I rolled out a bit of clay between wax paper, let it stiffen a bit, then rolled the imprint of real leaves(houseplant) into the clay, let it stiffen some more, then cut the leaves out and made vein lines, etc. They were then just laid onto the clay covered base and pushed in a bit to adhere. They are strong and quite realistic. Beautiful Eileen and what a great idea. Eileen, Yes, how do you keep him there would be my first question. Love how you made the leaves. I know you are busy, but I would love to see a post on the leaves. The whole thing is amazing. All those flowers and buds, not saying anything about the bird. Thank you. And the bit about the base I haven’t forgotten. If I ever get back to my tree, I used Styrofoam as the base. The idea of your type of leaves would be great, but could I make enough for a whole tree. oops, top view with the picture this time! What talent! Great tutorials on you tube Jonni. Thank you. I’m excited to get to sculpting again. I’m making a breakaway sculpture for A high school production of the little mermaid. But I don’t really want it to break completely because I don’t want to make three nights worth of sculptures! I think I might make the head break away from the bust instead of having the face break. I’m wondering if your glue and plaster combination recipe would be strong enough to land a fall without breaking? I thought I might just make two separate pieces. The head and a little bit of the neck to fit on top of neck and bust. Do you think that recipe you could handle a fall or do you have a better recipe? Hi Jeannine. I don’t think the shop towel mache would handle a fall like that. I use the plaster and glue (or drywall joint compound and glue) with shop towels, and it is strong, but the head will probably be hollow. With nothing to support it, I think it may collapse or crack when it lands, no matter what formula you use. Do you happen to know of an example of something like this on a website, so we could take a look at it? A link would help us see what you’re trying to do. Thanks for that advice. I wasn’t sure how strong the plaster mixture is. I made an armiture with brown paper and masking tape. I was thinking of covering that with the sculpty clay and paper maching over that then leaving the Clay and everything else in tact. Do you think that might give it enough substance? I only found a plaster sculpture suggestion with three layers of thin plaster. But I didn’t want to go about making a whole plaster mold and sculpture 3 times! Gosh – I just don’t know. I’m not in the habit of throwing my sculptures on the floor, so I don’t have any experience to go on. I do think that the paper mache clay recipe could be less prone to cracking than Super Sculpy, but I could be wrong about that, too. I hope someone with more experience will see your comment and offer some advice that’s more useful than mine. I am working on encaustic honey bee wax over paper mache. I am at the initial stage of creating the bowls. Any advise? I’ve never done any encaustic work. But maybe one of our readers will offer some advice. Is there something specific that you need help with? Hi Jonni..still not being able to do much more than digital art on my iPad I remembered making this fellow years ago and thought I would share him with your sculptors. 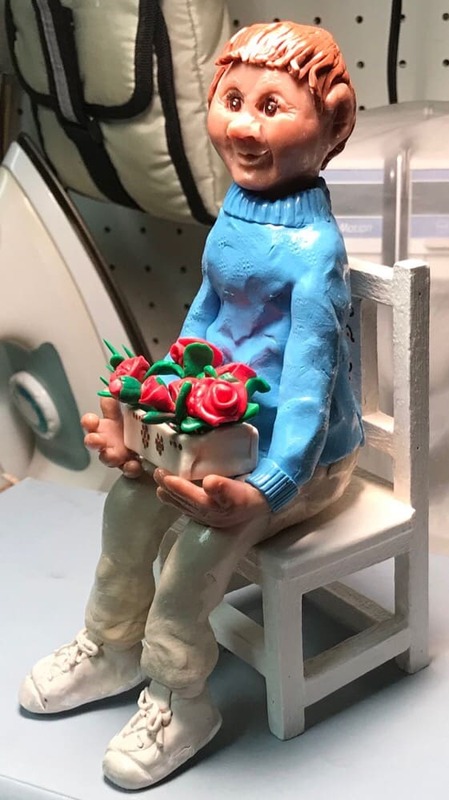 He is one of only two remaining polymer clay sculptures of the many that I made and I had fun making what I called “the lover”. I didn’t make the chair. Thanks, Jonni. I did a lot of sculpting with polymer clay until my old stove started turning everything brown almost black and I don’t have room for a toaster oven. I gave up for quite a while then started using purchased air dry clay. Still have a drawer full. The good thing about polymer clay is that it comes in so many different colours you don’t have to paint it. He is very sweet Joyce, you u can even see the weave of his sweater. Is that a box of chocolates under the flowers? I hope she said yes! Thank you, Eileen. Unfortunately she didn’t get a chance because he has been packed away in a box for years. I don’t have any room to display him now. He is breakable. He really is adorable Joyce, love it. Thank you, Corinne. Maybe I will take a photo of the other one and post it. I wasn’t too pleased with the face so that’s why I didn’t show it, but what the heck we all have created things were not completely happy with. Right? You are absolutely right Joyce. Besides that we are our biggest critic. You know that’s the good thing about art, one person can like it while the other persons prefers another kind of art. Joyce, nice to hear from you. Your character is great. I don’t know how you do that. Amazing. Take care, and let us hear from you! Thank you, Rex. My guy was made a few years ago from polymer clay.. The clay is rolled through a pasta machine several times until the desired thickness is achieved. I enjoyed working with it because you can make even tiny eyes with it…or even shoe laces. Thanks for the advice. I wasn’t sure how to respond directly to your comment so I put the response here. We do use it for various different things; it just sticks too much to his hands so I think I’ll try having him put flour on his hands. He can’t wear gloves, because he “sees” with his hands. And we painted the bowl to get that color. We are using your recipes for various things. We are about to start making a piece for a blind little girl. Her Mom asked us to do one for her bedroom. We were totally honored at the request. We are doing the art piece on a framed wooden canvas my husband made and the theme is Disney’s Tangled Movie. We will be doing the tower and the valley; and most of the shapes will be done with paper mache. Hopefully the paper mache sticks to the canvas-board so we do want it sticky. Just a note first; my website has nothing to do with artwork. However, I work with a blind – developmentally delayed gent. When I started working with him I searched for crafts to do with him which he could use his hands. We researched (I say we because I involve him in every part; I will read articles, play videos, and verbally describe pictures to him). Our artwork focuses on touch because he is blind; so we call our artwork “Touch Art Creations”. We made paper mache bowls for him to give as Christmas gifts this past year. They turned out great. My note to you is regarding your paper mache paste recipe; the air-dry clay. I wanted one which would air-dry hard. I have made it a few times and it is extremely sticky; what am I doing wrong? Thank you for your videos and website, it has helped us a lot. P.S. I attached a photo of our 1st bowl we made with your recipe. Hi Sherry. You can change the stickiness of the air dry clay recipe by adding more flour or corn starch. Because it was originally developed as a material to be added to an armature, it needs to be a little sticky. 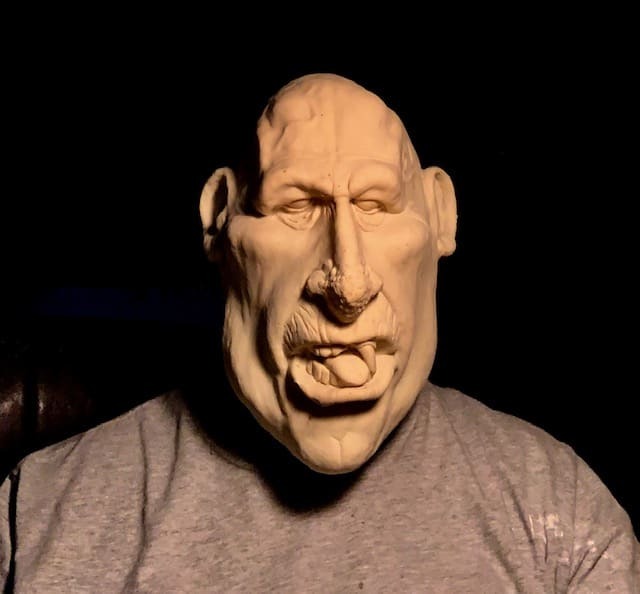 If you’re using it without an armature, you’ll still need it to be sticky enough so the clay will stick to itself – but you can play with the proportions and get it exactly the way you want it. Your friend’s bowl looks really nice, by the way. Did you add pigment to the air dry clay to get that beautiful color? Or is it painted? This is a great idea. I was watching a show the other day where a girl went blind. I was thinking, “What could I make then.” This is the perfect answer. Thanks. It is wonderful that you all can do this. Thank you for your advice. I will be trying these tips as soon as we get to that stage of the project. Since “my friend” is blind AND developmentally delayed we do things slowly. Plus I only work with him on these projects once a week. Right now we are using aluminum foil to make the shapes, the cliffs and hills. I had to find a way for the foil to adhere to the board since the artwork will be hung on a wall….I didn’t want the whole thing to fall off the canvas-board once hung LOL; plus a child will be “seeing” the artwork with her hands so it needs to be very sturdy. I am taking pics at various stages, then create a slideshow for him; we will be posting them on his Facebook page for his friends and family to see. Can’t wait to see it myself. Thanks. Jenifer. I can’t wait to get him painted. Ok Jonni, I am doing this against my better judgement, but I did say I would post my results when you were kind enough to guide me when I was stuck… This is my first time attempting any kind of 3 dimensional -anything- really. 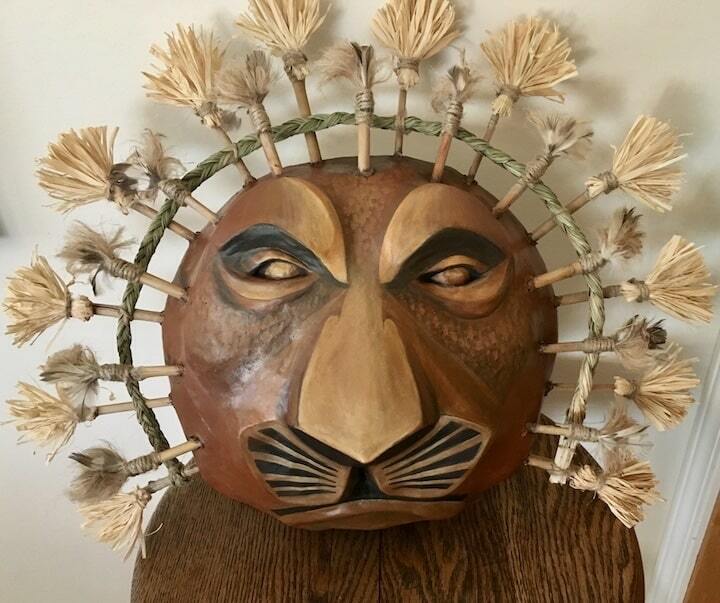 My 7th grader was recently in a Middle School production of Lion King Jr. and they asked if I could do the 3 main mask/headpieces. “Sure!” I said! what was I thinking??! I also figured I’d reply in case there are other moms in the same situation-searching for information, not knowing where to start. I started with cardboard, thinking I could use crumpled paper, masking tape to build the profile needed. But, I ended up having to build layers on layers to really get the depth I needed. In hindsight, I would just but some clay and sculpt, then mache over. Even though I have never played with clay before…I think it would have been easier and less time consuming than building with cardboard. Lesson learned. After I did the 5-6 layers of mache, the pieces were too heavy to wear for any length of time. I had to “excavate” the layers of cardboard and tape from the inside until I got to the first layer. Then I added a layer of mache on the inside to finish. Painting was super fun! It was trial and error but I think I figured it out pretty well? I have not used Acrylics so it was a learning experience! They dry much darker than on the palette. I had to go back with multiple glaze coats to tone it down, or brighten. OMgoodness I put way too much time into these, ha! But! The kids were over the moon, and my son (played Simba) was super impressed with his mom. So of course I am very pleased to be able to pull joy from an area of myself that was new, and kinda scary! Thanks so much for the encouragement and direction. 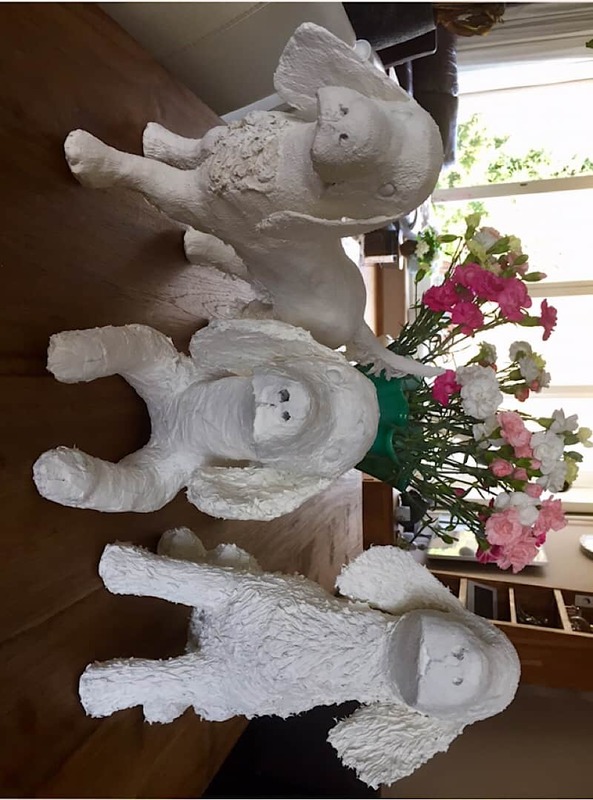 So glad I found your site, and I am adding paper mache to my list of things to experiment with! one of the hardest parts of this project was figuring out the engineering of how to get them on the kids heads and stay there while they ran, pounced, fell, played, got tackled… I had a not so fun afternoon that involved wrapping my scalp in saran, putting on an old baseball hat, wearing the shell of the Scar headpiece, while I used 3 way mirrors to fill the gaps with spray foam! : ) Thanks again Jonni! Wow – he’s fantastic! All of your masks look like they were made by a professional mask-maker. Congratulations! wow thanks Jonni! they were a little “cubist” looking, using the cardboard and all. But I am happy with them and it was a really challenging/fun process that I never would have tried if I hadn’t found your site! This stunning. Absolutely amazing.Love it. Jenifer, are you kidding me? Your first assignment is to find a sponsor so you can become rich and famous! All of your masks are great, and I’m sorry (a little) you had to suffer through the learning process. 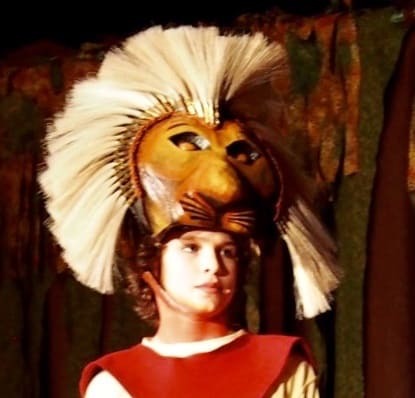 Seriously, though, Scar is my most favorite mask ever. The contrast in the painting is fantastic. Green eyes, perfect. Thank you for showing us. Everyone involved must be pleased and proud. Please don’t stop now just because you’ve had a perfect beginning. Thx Jonni , I was too tired to resize last night. But here are some images. here is Scar with a sanded skim coat of drywall compound/flour/water. Hi Jenifer. Thank you so much for writing about your experiences with this huge project you took on. I hope you had as much fun as the kids did. We still want to see your photo, too, but I see that you tried several times. It’s probably too big – most cameras save images in huge file sizes (it would take a monitor that’s 13 feet wide to show them at full resolution!). You can use this online tool to make them smaller. I do hope you’ll give it one more try. Jenifer, your masks are great! I like that they look as though they have been carved out of wood. I also like the different ways you created “manes” with different materials. Awesome work! Jennifer, all your masks are fantastic and look like you’ve been doing this for years, certainly not like these are your first! All the detail is fantastic and I particularly love the paint job. Keep it up! 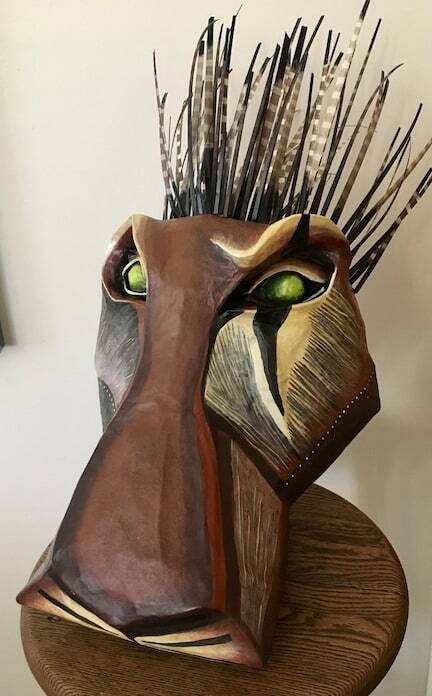 I wanted to share with you my paper mache class’s current project. A group of turtles is called a bale. So we have a bale of rampaging turtles! I love how each turtle is different with different personalities. We have fun in the class as well. Now on to our next project…some are doing Jonni’s chicken from her book, some have their own ideas. What a fun class you have! Your students should be very proud of them. 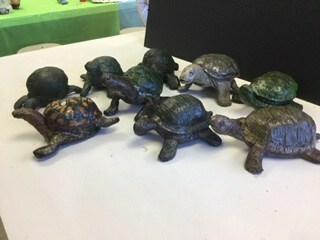 Did they use bronze coating on turtles? No, they all used acrylics, Browns, greens, etc. One gal attempted a box turtle as well to remind her of her grand-turtle! It is a fun class. They are perfect. Could pass for a real turtle. Great work. Eileen, thank you muchly for sharing your students projects. It is great to see them. I have a small collection of turtles, so my emotions slipped a little from admiration to envy! They are wonderful. Tell your students we love them. A bale, eh? Great to know. We looked it up during class. It is a case of teacher learning from students! Doesn’t someone in Hollywood need you for a “make-up” artist — whoever those people are that do magic? I was thinking about you last night wondering where you had gone. Be careful around that guy. Allan, you’re the best. Love the ? — and understand it. Sorry Rex. That was supposed to be a happy face. 🙂 thanks again. Hope all is well. Hey Jonni. Hope you and the group have been well. I wanted to share one of my latest projects. It’s a ogre latex mask. I haven’t gotten around to painting it yet. I sculpted it in WED clay then made a plaster mold. Filled with casting latex and Let it dwell for about an hour. Poured the left over latex back in the container. And let the latex dry for about 12 hours. Here’s a picture of the unpainted mask. Allan, when I got a notice about this class, I couldn’t help but think of you. Some people have really fun jobs! That’s funny – I’ve actually taken a few of their courses. 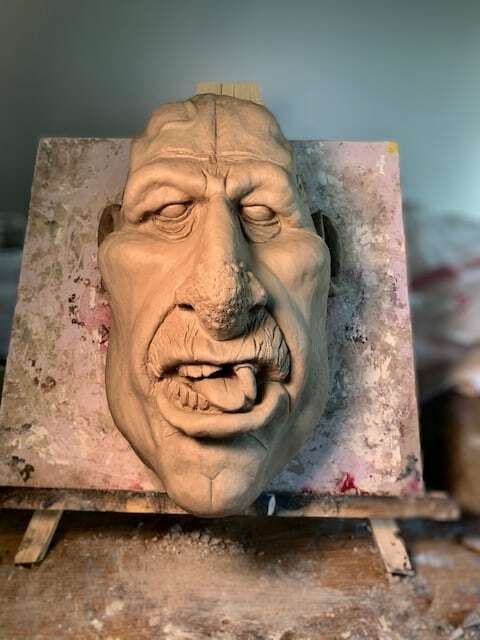 They have videos available about anything from sculpting to special effect fabrications. Hope all is well – nice hearing from you !